UPDATE ON DAGBLADET PUBLICATION OF NORWEGIAN SECURITY POLICE FACEBOOK PAGE OF PIG MOHAMMED……. – The Tundra Tabloids……. 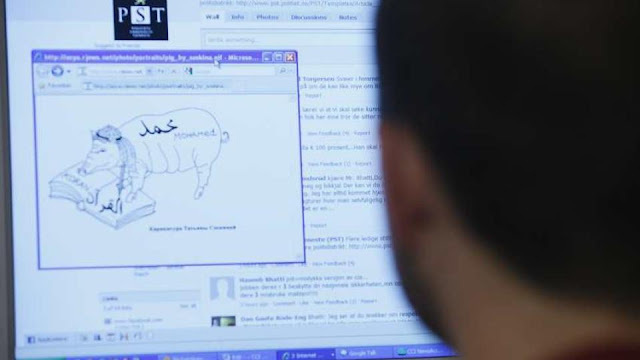 UPDATE ON DAGBLADET PUBLICATION OF NORWEGIAN SECURITY POLICE FACEBOOK PAGE OF PIG MOHAMMED……. Dagbladet’s publication last week of a cartoon showing the prophet Muhammed as a pig has caused strong reactions among Norwegian Muslims. Aftenposten columnist Usman Rana now urges calm among Muslim brothers and sisters. On Facebook and by SMS there are now several demonstrations planned in the coming days, but the former head of the Muslim Student Society think Norwegian Muslims have nothing to win by escalating the situation. “If young Muslims choose to participate in the demonstrations, it’s my strong recommendation that it takes place in a very civilized manner, and that people show loyalty to Norwegian symbols and the Norwegian flag – because this is also the homeland of Norwegian Muslims. People should also ensure that rioting elements don’t take advantage of the situation,” Usman Rana told VG Nett. “Norwegian Muslims should rather show their dissatisfaction by doing good and by showing a positive side as peace-loving, civilised and decent people who benefit society. That is what the Koran and the prophet Muhammed also say that people should do: Namely to counter evil with good,” the young Muslim told VG Nett. He calls on young Norwegian Muslims not to let themselves be led by people who have neither theological integrity nor deserve to be role-models for young Muslims and who express extreme attitudes on the Internet. “There are several who now wish to whip up the atmosphere on all sides. My strong recommendation is that young Muslims should be careful of being part of this evil spiral,” continues Usman Ranan. Next Post Next Post VP BIDEN NOW TAKES CREDIT FOR ALL THAT HAS GONE RIGHT IN IRAQ…….